Insite Solutions. We are your Floor Tape & Pavement Tape Specialists. 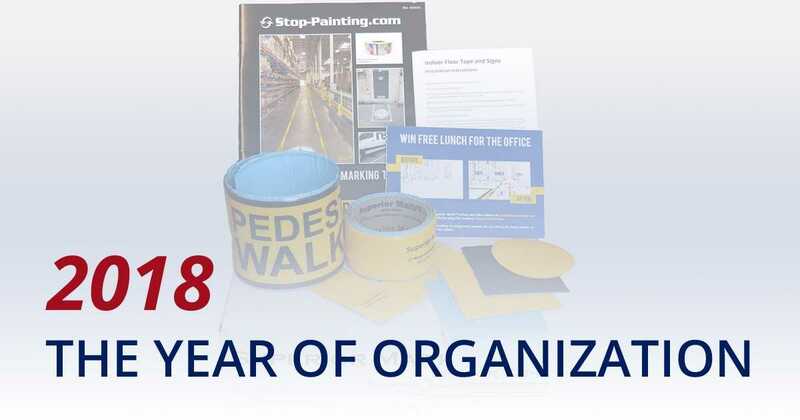 Stop-Painting wants to help you make 2018 the year your company gets organized – especially visually organized. Whether you’re going Lean, using 5S or just looking for a few new tools to help straighten up and cut down on clutter, we’ve got products and solutions to help you. As a company that is all about visual cues, we know no matter how we try to describe our products to you ­– via conversation or in a blog post – nothing can compare to actually letting you see our products for yourself. That’s why we offer a free Get Organized Box, full of samples of our most popular products. This box offers you an opportunity to see, feel and apply some of our products as you embark on your journey toward organization. Many of our customers order our Get Organized/Product Sample Box looking to test out one product, and end up finding another included sample product that offers a solution as well. Why is Stop-Painting different? First and foremost, we’re not JUST about selling products. Every worksite is different and has different needs for visual cues and safety products. While one workshop floor may find solutions with our Superior Mark™ Floor Tape, another workplace may need corner markers or rubber floor signs to meet their organization and safety goals. We try to put a wide variety of product samples in our Get Organized Box Sample Box, but if there is something you’d like to try out in particular (and it’s not included in the list below) call us at 1-866-284-1541 and we’ll make sure to get it to you. Every Product Sample Box includes a sample adhesive rubber floor sign, a set of Superior Mark™ corner markers, a small roll of Superior Mark™ Floor Tape, pavement marking tape, Superior Mark™ Pedestrian Walkway Floor Tape, a label protector, a sample of our Anti-Slip floor tape, a Superior Mark™ Floor Dot, a sample of Superior Mark™ Repeating Message Floor Tape and a catalog that showcases the hundreds of other products that don’t fit in the box. If you’re looking for a specific product sample, contact us via our website or call us at 866-284-1541 and we can create a custom sample box for you. 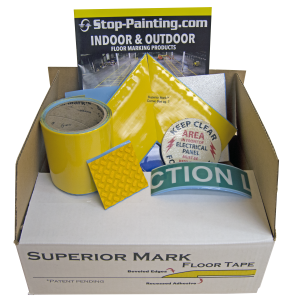 Some popular optional Product Sample Box items we can add include, GHS labels, Superior Mark™ Carpet Tape and Superior Mark™ Glow-In-The-Dark Floor Tape. Our flagship floor marking tape, Superior Mark™ Floor Tape, is produced in our facility in Wake Forest, NC and is the most durable and highest quality floor tape you’ll find. Superior Mark™ floor tape has a patented design with beveled edges and a recessed, highway grade adhesive for durability and top performance that sets the standard in industrial strength marking tape. We’ve researched, designed, tested and redesigned our Superior Mark™ products to ensure we are offering the highest quality floor tape on the market. Nothing beats Superior Mark™ Floor Tape for fast installation, easy maintenance and maximum strength for a tape that holds up under the heaviest industrial traffic. At Stop-Painting we know continuous improvement is the key to productivity and safety success in any workplace. What works one day can change the next with the addition of new equipment, new staff and a new workflow (thanks to better productivity, hopefully!). Be prepared to constantly improve your worksite with visual cues to promote productivity and safety. Consult with employees and seek out data about past safety issues at your worksite to seek solutions. Getting your worksite visually organized or Lean or using 5S practices is not a one-shot deal. To really succeed, you have to continuously improve and always be looking for new ways to further increase productivity and employee safety. Once our products have proven themselves useful to your business, keep our Get Organized/Product Sample Box and catalog on hand so you can refer back to it when new solutions are needed. Or, our expert consultants are always ready to listen and help find products to meet your needs at 866-284-1541. Try our Get Organized Box/Product Sample Box today and start your journey to a better organized business. Better organization=better productivity. Check out our Resource Center here, which is full of informational and educational articles about visual organization, 5S, components of Lean and more. Sign up for our newsletters and emails which always contain valuable information about visual organization, continuous improvement, Lean, 5S and employee safety products. Check out our products and give us a call. Our Expert staff can help you find more than just a product – we can help you find SOLUTIONS. Stop-Painting is a leading manufacturer of indoor and outdoor marking tapes and signs. We help facility and safety managers create more productive and safer workplaces by communicating with visual devices and visual cues. Visit our website or call 1-866-284-1541.